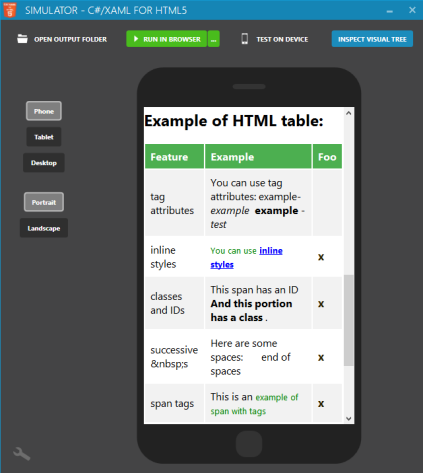 The HtmlPresenter control lets you easily embed custom HTML/CSS code inside your XAML, or create new custom controls using HTML code. The HTML code is inserted "as is" in the page. The CSS code is automatically merged to the page Header. Refer to the "Example 1" below for a more complete example. DOMELEMENT: You can call the ".DomElement" property to get a reference to the root of the instantiated element in the DOM tree. Note: the control must be loaded in the Visual Tree for this property to return a non-null result. To ensure that this control is loaded in the Visual Tree, you can read the property "IsLoaded", or you can place your code in the "Loaded" event handler of the control. See the "Example 2" below for an example of how to interact with the DOM element. 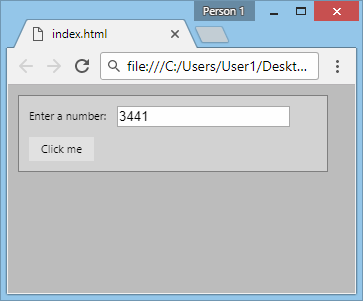 Create a new project of type C#/XAML for HTML5 - Empty Application. Let's name it "Application1". <code>commodo vitae</code> , malesuada fames ac turpis egestas. <a href="#">Donec non enim</a> in turpis pulvinar facilisis. Ut felis. <strong class="demoClass">And this portion has a class</strong> . <a href="http://www.cshtml5.com">This is</a> an example of link. Start the project to see the result. if (this.DomElement != null) //Note: the DOM element is null if the control has not been added to the visual tree yet.